Louie loves to play with sticks and pine cones when he goes out in the backyard and I don’t mind letting him run around with a stick, but I have started pulling it away from him if he settles down to chew on it. 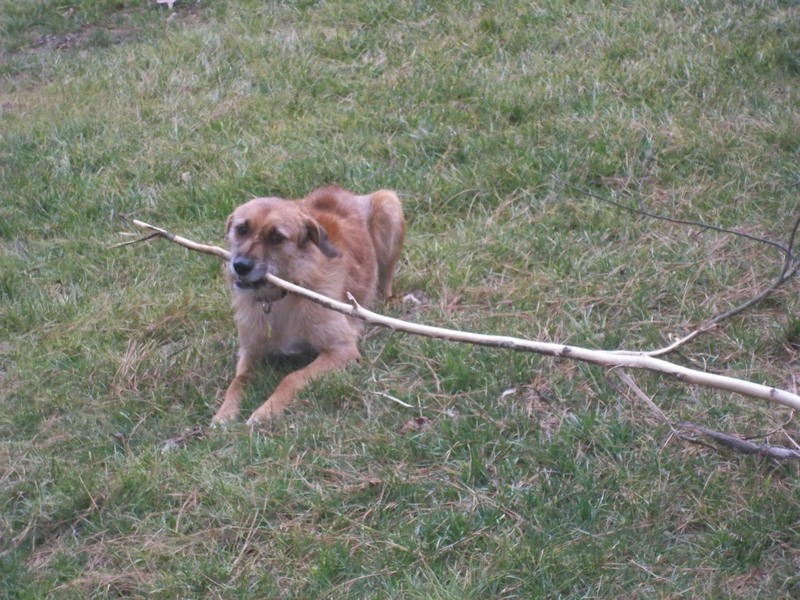 A stick can cut a dog’s mouth, splinter and get stuck in his throat or even cause an intestinal blockage. None of this is good for your dog or your wallet! Louie doesn’t really chew on the stick like he does a bully stick or an antler, but he does have fun trying to keep me from getting the stick. He doesn’t grab sticks or pine cones on our walks, but he likes the long sticks that have fallen in the backyard over the winter. 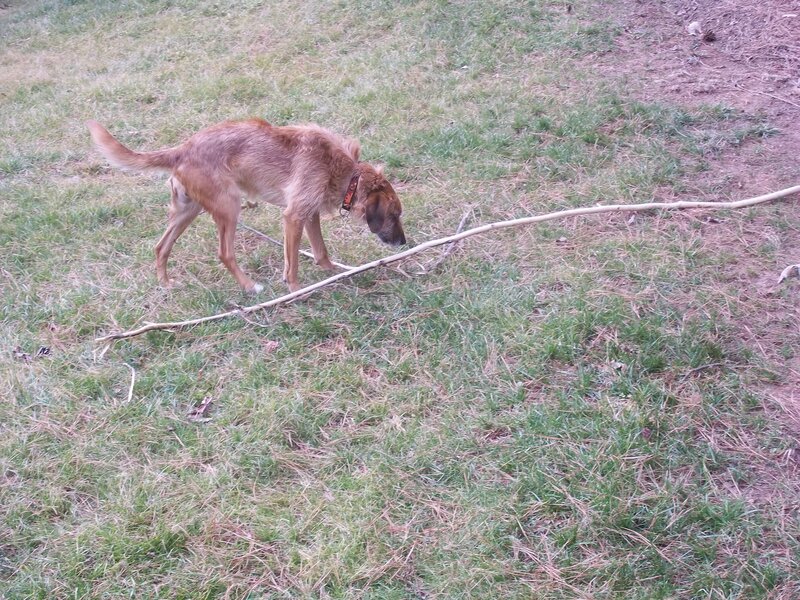 He had one that was a good 7′ long that he was dragging around the yard. It was an absolute howl to watch. This gives you an idea of how long the stick was. For awhile, he would grab it at the end as in the picture below and then run in a circle as the other end of the stick barely moved. He wised up though, and grabbed it in the middle and pranced around like a Flying Wallenda. I was heading back into the house to grab a camera when I saw him picking up steam as he headed for two pine trees that were only 5 or 6′ apart . . . with the middle of that 7′ stick in his mouth . . . 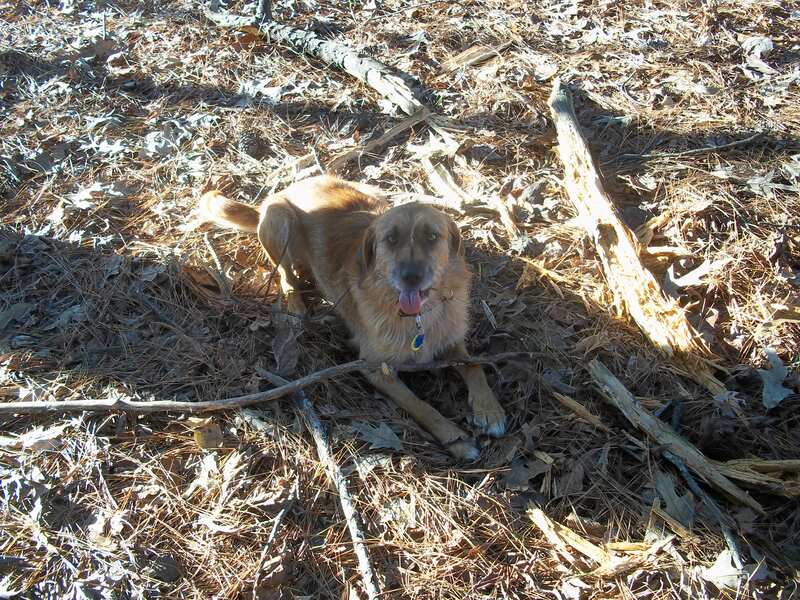 It was like everything switched to slow motion, both ends of the stick hit the pine trees and broke off, Louie looked a little dazed for a few seconds and then dashed through the trees with the remainder of the stick in his mouth and dared me to take it away from him. He seemed none the worse for wear and tear, but he really did slam into those trees. Say no to this look! I have to admit I nearly collapsed laughing so hard, but that’s what I love best about having a dog. They make you laugh every single day. Louie is a born comedian and as long as he doesn’t try and eat the stick, I’ll continue to let him play with them. 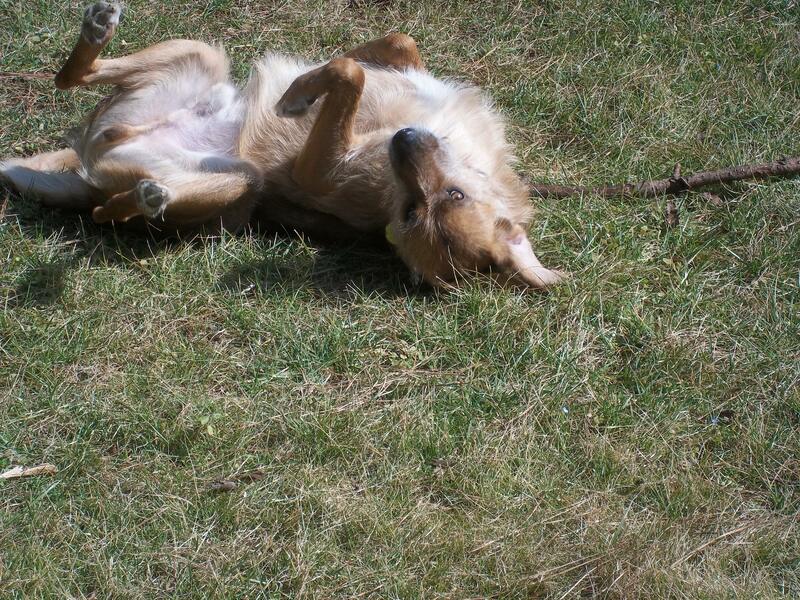 This entry was posted in Uncategorized and tagged animals, canine, Flying Wallendas. Bookmark the permalink.